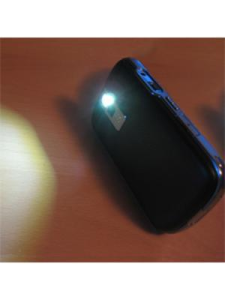 Unlike most flashlight apps, One Touch Flashlight employs BlackBerry video light, NOT the dim, LED screen light, delivering more light more quickly. What makes JaredCos Flashlight better than the other flashlight apps? - The brightest flashlight when and where you need it. You will have a flashlight everywhere you go! - The original BlackBerry flashlight app to use BlackBerry video light source rather than the low-light LED screen employed by other, so-called flashlight apps. - Flashlight uses less power. - One touch on/off icon for the flashlight lets you see trouble before it becomes trouble. - Over 4,000 great reviews. - Most downloaded Flashlight of all time. JaredCos Flashlight: Because you just never know when youll need to see the light. On the 8520/8530/9330/9300 there is no flash so the app will turn on the front LED to bright white and the screen on to full white to give off as much light as possible. On the Playbook there is no flash so the app will turn the screen on to full white to give off as much light as possible.